Kate Holloway owns and runs Water Lane Workshops, where she teaches classes on repainting old furniture with vintage paint effects, crafting beautiful lamp shades, plant design and wreath making. Her barn now serves as the perfect place to indulge her passion for upcycling. ‘I love the idea of rescuing something that has been thrown away and giving it a new lease of life,’ says Kate. ‘It prevents waste and is cheaper – why buy new when charity shop pine can look just as stylish with a bit of TLC?’ To inspire you to get upcycling, Kate has shared her step-by-step tips to three simple vintage-style paint effects: distressed, gilded and cracked, and chipped, to help you turn dull, dated and unloved furniture into elegant, unique pieces perfect for a period home. My favourite places to pick up pieces of furniture at bargain prices are charity shops, particularly those that specialise in furniture. Auctions are great, too. I place a bid before the auction begins, by phone or online, to make sure I don’t get carried away in the room, and then phone back later to see if I’ve won. I always try to ignore the finish when sourcing furniture as paint can cover this – the shape and style are the most important factors. Look for pieces with curves and interesting details, as they are best suited to antique-style effects. Anything with relief is perfect, as this detail can be brought out with techniques such as gilding or dry brushing. As it isn’t very fashionable at the moment, pieces made from dark wood are extraordinarily cheap, and there are plenty about. They will need a coat of white primer before painting in your desired paint effects and may require extra coats. Always check that the piece is structurally sound. I tend to avoid internet auction sites because I like to see the piece in person to make sure that it’s not going to fall apart. Furniture paint effects aren’t a science: they’re an art, so don’t be afraid to experiment or of making mistakes – some of my best creations have been made by accident. Once a pot of red paint leaked all over the inside of a drawer. I thought it looked really fun, so now I’m always painting the insides of drawers and cupboards to give an unexpected colour pop. This tired oak table was a fleamarket find, which has been transformed into an elegant desk using a distressed, French-style painting technique. Dust the furniture down to remove any debris. In a well-ventilated area, use a small brush to cover any knots in the wood with knotting solution to stop any sap coming through the paint at a later date. Allow to dry for around five minutes. Select your paint shade and give the tin a good shake. Holding your brush lightly, paint the piece in long, even strokes, taking care not to overload the brush – too much paint will create drips and will not achieve the smooth finish desired. Apply two coats. Once dry, use a fine sanding block to even out any brush strokes or drips. Then take a fine-grade wire wool and rub the painted surface – this will bring out the pigment in the paint and create a beautiful sheen. To achieve a distressed look, rub with sandpaper to expose areas of natural wood. Next, using a lint-free cloth, apply a soft clear furniture wax to protect the piece and a give it a soft sheen finish. 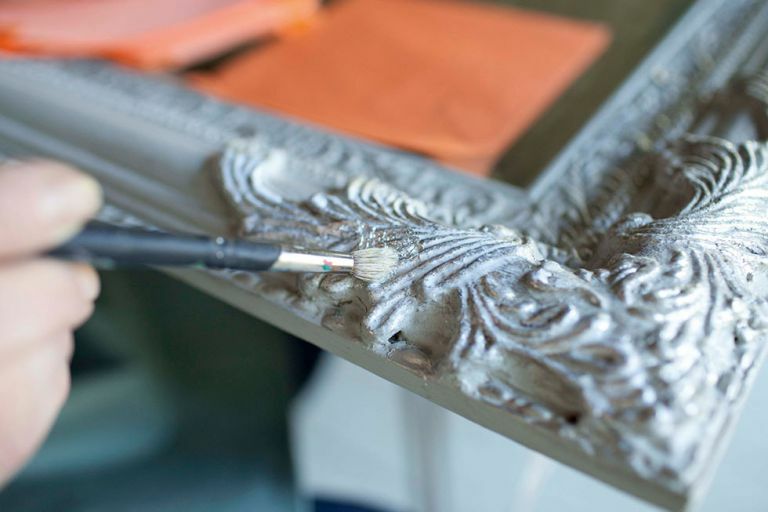 *Optional* If your chosen piece has brass handles, try painting them, rubbing with wire wool and sealing with wax to bring out a touch of the brass while emphasising the detail. Complete with beautiful ornate detailing, this unwanted mirror was picked up at an auction for just £30. It had a garish gold finish, but is now fit for a sophisticated French-style boudoir thanks to a lick of grey chalky paint and silver gilt detail. Give the frame two coats of paint, making sure to cover all the nooks and crannies. Once dry, use a small brush to apply the size to the areas you wish to gild. Apply two coats. After a few minutes the glue will turn clear and become tacky. Take a sheet of silver or gold leaf and carefully place it over the tacky areas. Starting at the highest point, press the leaf into place with a small brush. For a solid gold finish, you may need to repeat the process. When you are satisfied the area is covered, remove any excess sheet with a small brush. Wipe the gilded area with a thin layer of clear wax. *Optional* If you want an aged effect, you could add a dark wax at this point, but you must apply a clear wax first. Once dated with a dark stain and highly varnished finish, this side table (below) has been transformed into a pretty vintage-style piece using a cracked and chipped paint effects to complement a traditional, country-style interior. Apply two coats of thick paint in a random fashion (a pale shade will give best results), adding extra coats to areas where you want more chipping. To create the cracked look, dry the paint quickly using a hairdryer. Start with the dryer close to the surface, then move it away when deep cracks start to appear. If you don’t get cracks first time, apply more paint and try again. Once dry, use sandpaper to rub the edges of the furniture in places where you want a chipped and worn finish. Apply a wash of watered-down paint in a darker colour; this will emphasise the cracks and give the piece an aged look. If you apply too much it can be taken off with a cloth. To give further age and texture to your paintwork, apply a dark wax using a lint-free cloth. Apply a little at a time as it can be very dark. Finish by applying a clear wax with a lint-free cloth and removing any excess.